My man Scott McLemee roars back from his writer’s rest with righteous revolutionary rock! * Ladies and gentlemen, the MC5! Obligatory warning for the easily offended: there are naughty words. 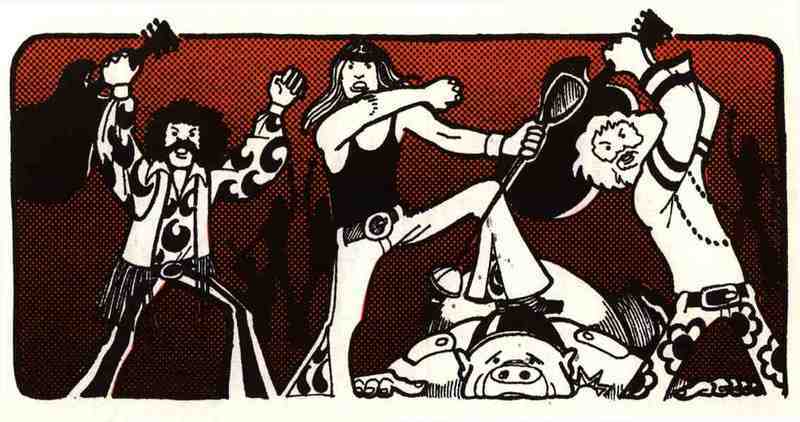 Here’s an image from John Sinclair’s Guitar Army, one of the most interesting countercultural publications from the utopian late-1960s-early-1970s years. (It isn’t in print, but you can still find copies on Ebay. **) This image (by Gary Grimshaw, a wonderful rock-poster artist) somehow tells you most of what you need to know about the WPP’s brand of revolution-through-culture. They’re offing the pig . . . with rock’n’roll! *It is my hope that James Ellroy’s soon-to-be-released (?) final volume of the American Underworld trilogy will not read like this sentence. Those of you who bought Destination: Morgue! know what I’m talking about. **UPDATE: It IS in print! I’m commenting because “0” comments just doesnt’t seem right. MC5: I like the fact that it is an impulse; a new direction coming from the midwest rather than from NY, LA or London. KIck out the jams, brothers and sisters, and props to Creem magazine, Dr. Funkenstein, Alice Cooper, Aretha, Stevie Wonder, and the rest of the Michiganders. It seems the MC5’s “revolution-through-culture” ethos previewed not only punk and metal but arena-esque house music. And the KLF were worthy follow-ups in their own efforts: a U.K. #1 single in 1988 composed of a mash-up between Gary Glitter and the Dr. Who theme song, dropping dead sheep off at a BRIT awards after party, and the public burning a million pounds after their “official” retirement. That’s nice poster art from Grimshaw. It’s better than the comix art I’ve seen from him.